Americans throw away 2.5 million plastic bottles every hour. Many of these are plastic water bottles disposed in school trash bins. Even if these bottles make it into the recycling container, they still represent a resource that might not have been used in the first place had the “rethink” strategy been practiced. Rethinking our waste-producing habits so that we conserve or reuse resources is the strategy King County places above recycling. Hydration stations in schools make it easy for students to rethink their disposable water bottle habits. Hydration stations encourage students to use refillable water bottles instead of using plastic bottled water. Stations include a water fountain, a water bottle refill spout, and an electronic count of water bottles filled at the station. The electronic count shows how many single-use bottles have been saved from being thrown out. Mercer Island High School installed three hydration stations in 2013. In the first month after installation of the stations, students refilled 3,000 durable water bottles, thus reducing the number of single-use plastic bottles. At the Secondary Academy for Success in Bothell, every student was given a reusable water bottle as an incentive to use the hydration station. Within two months, the school was able to eliminate the use of over 1,000 plastic water bottles. At Global Connections High School in Seatac, marketing students organized an awareness campaign called Fill ‘er up! It resulted in a 70 percent increase in the use of their water bottle refill station. 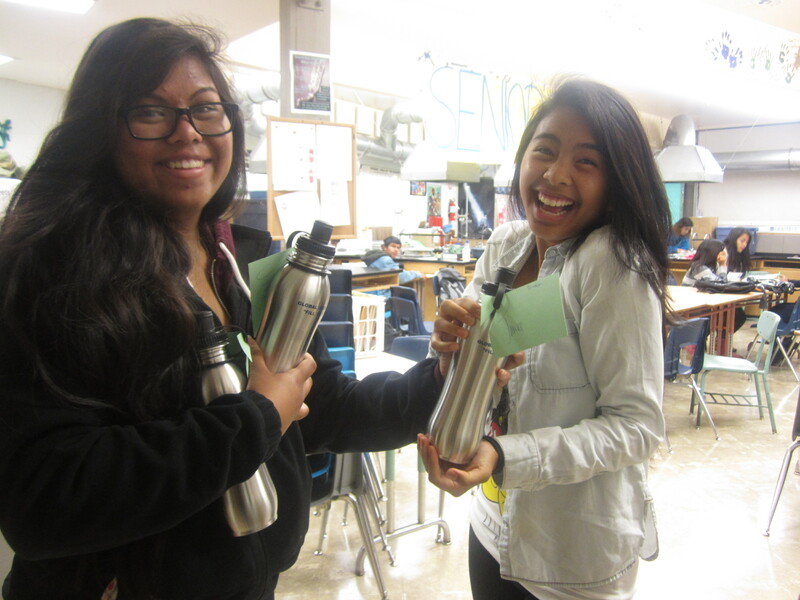 They also raffled off 70 stainless steel water bottles to students and staff to encourage even more participation. Installing hydration stations and publicizing their benefits can drastically reduce the use of single-use plastic bottles at school. ← What’s Your Green Team Project?